The Fort Drum Green to Gold Team is currently working on a project to unite with other ROTC counterpart battalions to share information and build communication. We are tentatively calling it Green to Gold 2.0, and we are heavily utilizing social media to accomplish this. As part of our One Team Synergy effort, which will bring about Green to Gold 2.0, we have prepared this analysis based on multiple conversations we have had with our counterpart battalion partners and with ROOs on the leading edge of social media outreach. The Fort Drum Green to Gold Team found its earliest success in using Facebook as a means to connect with enlisted Soldiers who were interested in Green to Gold. It is widely acknowledged by now that Facebook is the king of social media. It is versatile and can be used in many ways by different types of organizations. Breaking this down, we find that to maximize outreach potential and sustaining relationships with others in the social media environment, a full Facebook profile is probably the best option. The Fort Drum Green to Gold Team uses a Facebook profile. We attribute a good part of our success to that profile. If your organization needs to have a “voice” and has many subscribers who are interested in passively getting info, but don’t necessarily need to join the discussion, we find a Facebook Fan Page is probably the best option. The U.S. Army Cadet Command (ROTC) web page is a good example of successful use of a Facebook Fan Page. If your organization needs to have more internal communication and sharing capability, but doesn’t necessarily need to do a lot of outreach, perhaps a Facebook Group Page is the best option. 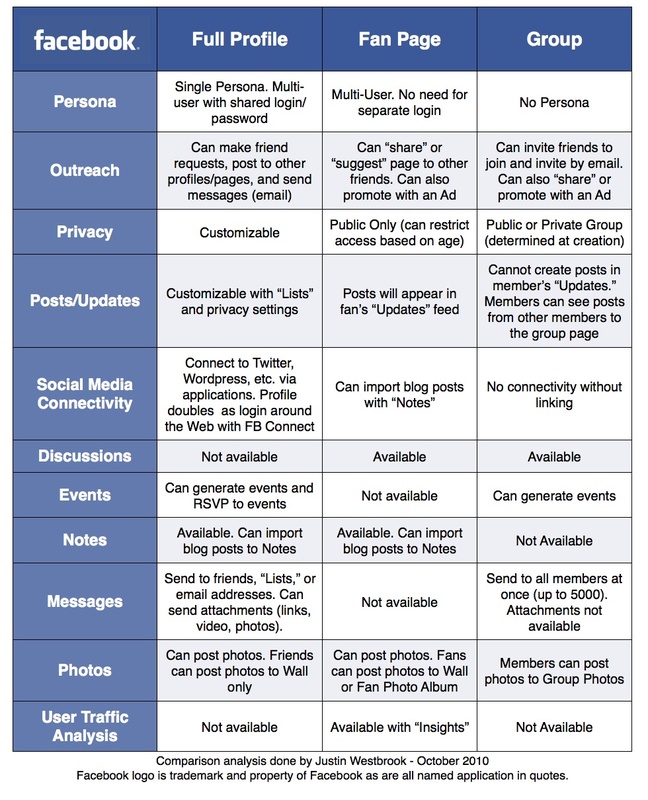 A lot of club-like organizations use a Facebook group successfully. We hope you’ll have the chance to use this information to optimize your Facebook use and tailor it to your organizational needs. We are also happy to answer questions, or put you in touch with some of the experts that we consult. Contact us. This entry was posted in One Team Synergy and tagged Facebook, Green to Gold 2.0, Marketing and Advertising, Social media. Bookmark the permalink. Also, you can send messages to people who “like” a FB page, and you can even include some attachments and customization. There are many other ways to customize pages as well. I’m curious: Did you consider Ning as an option? Though it’s not free, its platform can provide all of the functionality you included in your analysis and more. Thanks for this reminder, Courtney. The way I’ve seen this be most successful is by lashing the “organizational” user profile to a personality at the office. Having this “human face” as part of our own account has probably been what has made us successful in reaching out and sustaining relationships with the people we need to be in touch with. Hmm, but what if that person has/wants to create a personal profile? I still think that could be a violation… Or maybe I’ve misunderstood what you’ve written…I’m not saying I agree with FB’s terms, but they’re clearly defined.